All evidence points to autonomous vehicles being safer than those with humans behind the wheel, but accidents still can happen. Google wants to lessen the chance of collisions between its self-driving cars and pedestrians proving fatal by using a unique solution: an adhesive substance that sticks people to the hood of the car in the event of a crash. When a person is struck by a moving vehicle, it’s often the secondary impact – flying off the hood and hitting the roof, road, or into the path of another car – that causes the most severe damage. While Google’s method won’t reduce the force of the initial collision, it should stop pedestrians and cyclists from suffering extra harm. Google was awarded the patent for this form of human flypaper two days ago following the original filing in 2014. 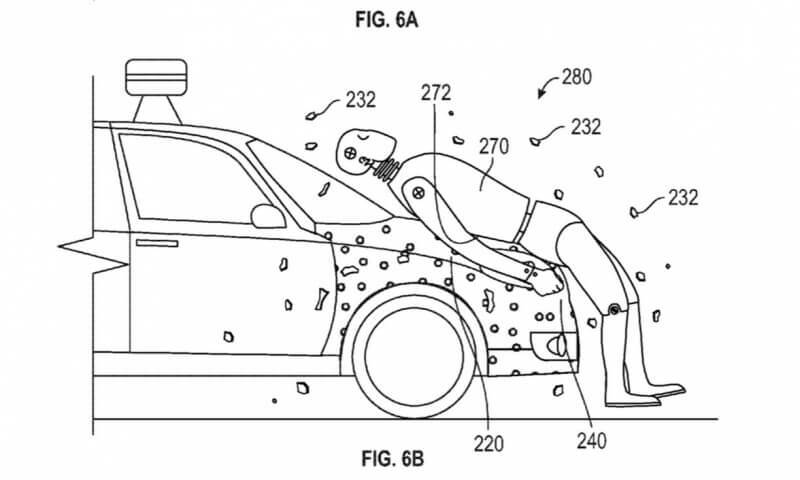 “Ideally, the adhesive coating on the front portion of the vehicle may be activated on contact and will be able to adhere to the pedestrian nearly instantaneously,” states the patent description. To stop everyone and everything sticking to the hood of the car as it drives about, an “eggshell”-like coating is placed over the adhesive, meaning the stickiness is only activated when this layer shatters at the point of impact. While the patent states this method is aimed at self-driving cars, it does note that it could be applied to any vehicle. Many car manufacturers have come up with innovative ways of protecting people from collisions with vehicles. Citroen, Jaguar, and Nissan all use devices that slightly raise a car’s hood in the event of an accident to provide a cushion for impact; and other companies, such as Land Rover and Volvo, have developed outside airbags.